Join the discussion on our forums! Come discuss Rabid Worgen over in our dedicated Rabid Worgen discussion topic. This is what Enraged Worgen died 4???? This is exactly what warrior needed: Rush on turn 3 for Woodcutter's Axe to buff. Tempo Warrior has some pieces falling into place. 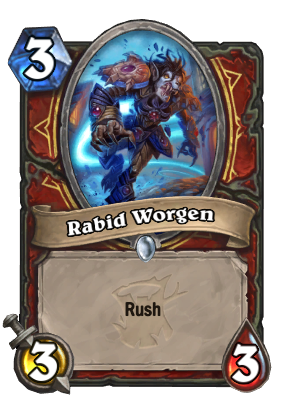 Such a itty bitty wonewy warrior card reveal all alone by itself, with only 4 comments hours after release. It might not look like much but this card will piss you off. Decent 3 drop but it's just a plain 3/3 that will get most of it's value if coined and traded into 2 attack minion. On turn 3 it will die in 90% of cases. I do want warrior to be viable though. I kinda miss the class. how on earth is this a bad card?